The 1415 Girard Street Cooperative was established in 1950 to secure permanent affordable housing by converting a rental building into cooperative homeownership. In 1992, with the support of the Development Corporation of Columbia Heights (CDC), the cooperative was restructured and the units were renovated and sold to new owners. Subsequently, inadequate property management, deferred maintenance and changing demographics helped to push the cooperative toward financial insolvency. Now due to revitalization, the community has become more popular and housing prices are soaring. Last year, the cooperative received pro-bono legal assistance from the law firm of Greenberg Traurig, who in turn, assisted in identifying a new management company. In an innovative partnership possible because of our unique ownership structure, City First Bank and its affiliate, City First Enterprises, teamed up to provide financing. City First originated a $490,000 bank loan and an additional $535,000 in the form of a recoverable grant, was provided by City First Enterprises. 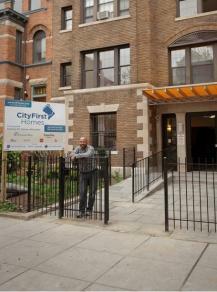 The funds were used to refinance an existing loan and to renovate vacant units for sale on the open market. The City First financing allows the cooperative to continue operations, balance and diversify its ownership, bring in much needed revenue to the cooperative to support its operations and preserve 20 units of owner occupied affordable housing.